Philipsburg, St. Maarten, December 20, 2017 – Four local foundations got a much needed financial boost recently. They shared a USD $25,000 donation from regional bank CIBC FirstCaribbean. The bank continues to stand with St. Maarten and others impacted across the region. 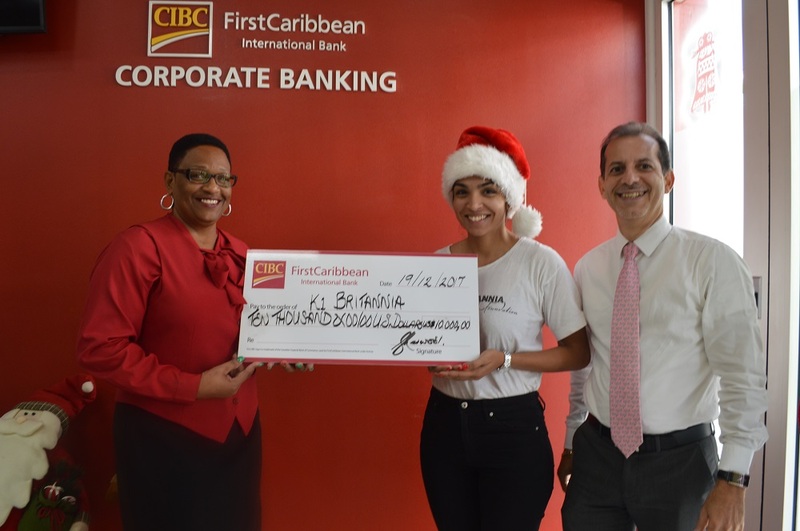 “It shows CIBC FirstCaribbean’s long-term commitment to the territories in which we operate and our resolve to do so “hand in hand” with civil society”, stated Country Manager, Garth Sherwood. Photo caption: Left to Right: Rosalie Glasgow, Customer Service Officer, CIBC FirstCaribbean, Priya Thirumur, Vice President, K1 Britannia and David Solomon, Senior Corporate Manager, CIBC FirstCaribbean. Photo provided. CIBC FirstCaribbean is the largest, regionally-listed bank in the English and Dutch speaking Caribbean serving over 400 000 customers in 17 markets, through approximately 2,700 staff, across 100 branches and offices. The bank, which has almost 250 years of combined experience in the region, offers a full range of market-leading financial services in: Corporate and Investment Banking, Treasury Sales and Trading, Retail Banking, Wealth Management, Small Business and Credit Cards. CIBC FirstCaribbean is a member of the CIBC Group. CIBC is a leading Canadian-based global financial institution with nearly 11 million personal banking and business clients. Through our three major business units – Retail and Business Banking, Wealth Management and Wholesale Banking – CIBC offers a full range of products and services through its comprehensive electronic banking network, branches and offices across Canada with offices in the United States and around the world.